A tank battery will generally have just a few pressurized tanks, but may have a number of vessels at atmospheric pressure used for a variety of purposes. While pressurized vessels have some peculiarities, it’s important to understand that having a good understanding of the more basic atmospheric vessels is also extremely useful. These tanks are very versatile, and often one tank may be used several different ways on a lease. There’s a few vessels that every lease pumping operation is likely to have, such as stock tanks and gun barrels, that we’ll cover in detail. Tanks also come in a few different styles and materials. First, though, it’s probably helpful to have a clear idea of what is meant by atmospheric pressure and pressure in general, particularly when you’re talking about lease pumping. Atmospheric pressure varies depending on your height above or below sea level. At sea level the pressure of the atmosphere pressing down is about 14.7 psi. As you get higher, there’s less atmosphere pressing down and so the pressure is lower. If you’re below sea level atmospheric pressure will be higher. Because pressure varies depending on altitude, it’s possible you may see pressure measured in pounds per square inch absolute (psia). That unit means that the pressure has been measured in comparison to a vacuum, meaning it was compared to a complete lack of pressure. Figure 1. An example of atmospheric tanks in a tank battery. Seen here is a gun barrel, a few stock tanks for storing oil, and a couple of water tanks. Pounds per square inch gauge (psig), on the other hand, measures pressure in comparison to the local atmosphere. As an example, imagine a car tire that has been pressurized to a standard 35 psi at sea level. The 35 psi is also 35 psig, as it’s in comparison to the local pressure. The tire would be at 49.7 psia, however, as that number includes the atmospheric pressure (35 psi of the tire + 14.7 psi of the atmosphere at sea level). It’s often helpful to know the local atmospheric pressure. 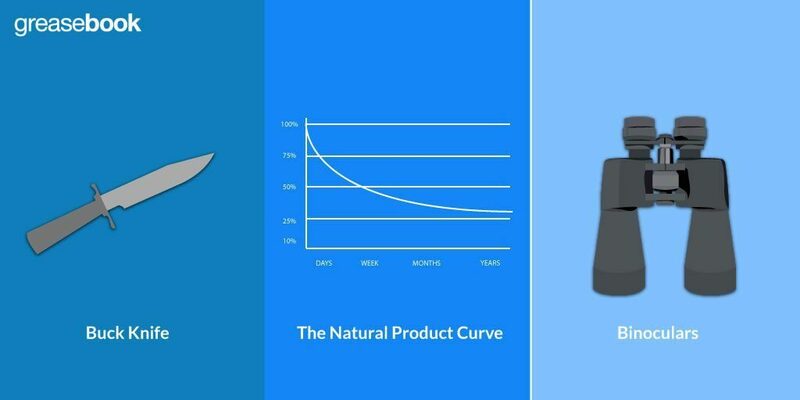 Whenever your produced fluid moves from a higher pressure to a lower pressure system, or has a lower pressure due to motion, additional gas is going to be released. 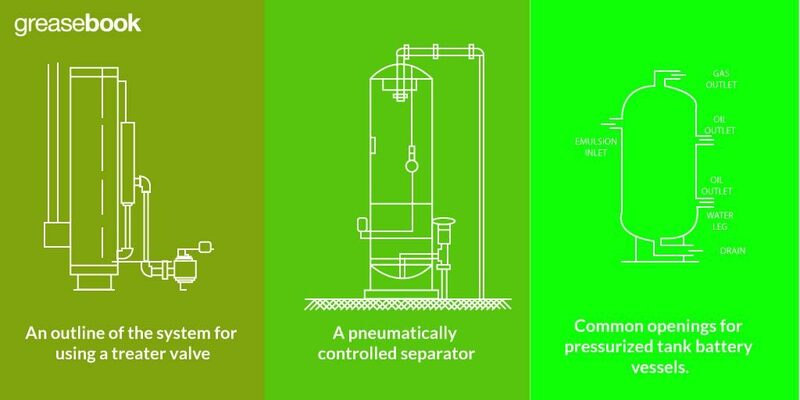 This is true when the oil goes from the heater-treater to a stock tank, and to a lesser extent when water is separated and then routed to the water disposal tank. If that gas can be recovered, it can be sold, so most atmospheric vessels actually have a small amount of back pressure to reduce loss of gas and lighter weight components than produced oil through evaporation. It’s usually no more than a few ounces (between 2 and 8), however it’s enough that pressure safety measures are needed. Most tanks have a thief hatch, which is a hatch in the top of the tank that allows you to access the inside. These hatches will have a safety pressure relief, and the gas vent line will also have a relief valve. In addition to the backpressure, these tanks have to also handle pressure from the weight of the fluids inside. A few rules of thumb can make calculating that pressure fairly straightforward. Oil weighs about ⅓ psi multiplied by the depth of the fluid in feet. As an example, say a tank is full to a depth of 9 feet. The oil itself would exert a pressure of 3 psi, but it’s important to remember the tank’s backpressure should also be included. If the backpressure is about 4 ounces, the total pressure on the bottom of the tank is about 3 pounds 4 ounces per square inch. Water, on the other hand, has a pressure of about ½ multiplied by the depth. So, a water disposal tank full to about 8 feet would have a bottom pressure of about 4 psi, plus any backpressure. As technology has advanced, so has the construction of tanks and vessels. In the past, they were often made of redwood. As you might imagine, there was a number of problems with using wood. Where they are used in a modern operation, they’re used for water disposal tanks or as gun barrels. Bolted steel tanks have been common, though they’re largely being replaced with welded steel tanks. Steel tanks are also now commonly being lined with fiberglass to prevent corrosion. Corrosion resistant paint is also available and might be a good investment for steel tanks. Figure 2. You can see some example tanks here, with fiberglass tanks on the right and welded steel tanks on the left. Fiberglass is another popular material for building tanks, though it’s light enough that empty tanks can sometimes face problems in high wind. Fiberglass is a popular choice for water disposal tanks, particularly where corrosion is a problem. With fiberglass, it’s not a bad idea to put guy wires at each corner of the tank to keep it stable. Tanks are available in a few different sizes. 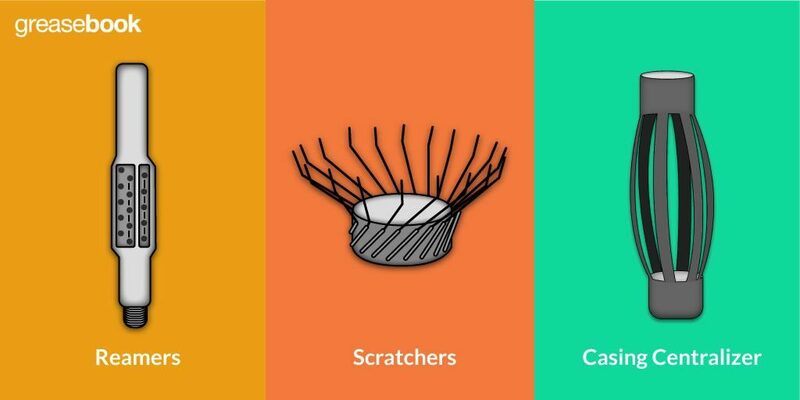 You’ll want to pick the specific type and size that fits your operation’s needs. Here’s a few standard sizes, to give you an idea of what’s available. Standard capacity for welded steel tanks. 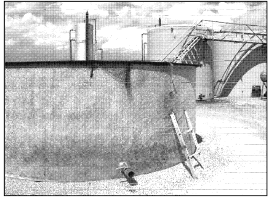 Fiberglass tanks are similar in size and capacity to welded steel tanks. Figure 3. Basic layout for a tank at atmospheric pressure. Most tanks will have the same basic layout of openings. Whether the tank is used as a gun barrel, stock tank, or for some other use is going to depend on how the openings are used and what they’re hooked up to. We’ll look at each use in more depth, but it’s probably helpful to have a general understanding of what that basic layout is first. You can see an example layout in Figure 4. On the very top of the tank is the gas outlet, which leads to a low pressure system for handling gas and has a valve that maintains that small backpressure discussed above. If this tank doesn’t have the backpressure, it’s likely you’ll see less oil produced than expected. The difference is due to the evaporation loss. The valve and backpressure also help keep oxygen out of the tank. Natural gas and air are a dangerous combination, and a mixture of the two can lead to an explosion. A tank filled entirely with natural gas is actually much safer. On top of the tank, but not quite at the very top, is the emulsion inlet. There is usually a walkway or ladder to this inlet for easy access to the valve that opens and closes the inlet. Simply having fluid fall from the top of the tank to the fluid level can cause static electricity that encourages hydrolysis, and therefore corrosion. It can also lead to losing fluid to evaporation, so it’s common to have a tube, called a downcomer, leading down from the opening to near the bottom of the tank. The highest opening on the side of the tank can be used for a couple different things. It can lead to an overflow line, which in most cases will lead to a lined pit or the water disposal tank. Alternatively, it can be an equalizer inlet. When several tanks are connected in series through an equalizer, one tank will be totally filled before the next begins to fill. The equalizer keeps the first tank topped off, even when you’re not there. 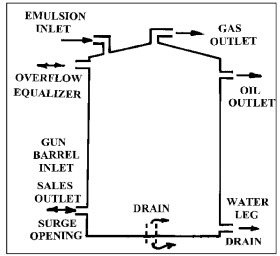 The oil outlet is generally near the top, but below the equalizer/overflow. When the tank is being used as a gun barrel, this is where the separated oil flows out. It’s height determines the level of fluid in the gun barrel. If the tank is being used as a skimmer tank, it can also be used as an oil outlet. A side outlet is useful in a few different circumstances. It can be the opening leading to the water leg when the tank is being used as a gun barrel. It can be used as a water drain, and for tank maintenance like cleaning the bottom of the tank. The very lowest opening is the drain. The most common style of tank is flat-bottomed with a drain on the side. Other types, discussed below, have conical bottoms. A gun barrel (sometimes known as a wash tank) is another sort of separator, washing water from the oil before it’s sent to a stock tank. A gun barrel is driven entirely by gravity. Fluid flows into the gun barrel from a side inlet, and then is sent down through the tank using a spreader. The heavier water falls to the bottom where it’s sent to the water leg. The lighter oil floats to the top and flows out through the oil outlet. Some gas will also be separated and routed through the gas line at the top. Figure 4. A gun barrel made from an older separator and mounted on a platform. A water leg is a fairly standard setup for handling water disposal that is used with a number of vessels in the tank battery, like a heater-treater. Essentially, the water that drains from the bottom of the tank is forced by the weight of the fluid up into the water leg, which is a vertical, narrow pipe inside a taller, wider diameter one. The water flows up the inner pipe, then overflows into the outer pipe where it is then collected and sent to the water disposal tank. This helps keep the slight backpressure, and can also help control the level of the water in the tank. Figure 5. 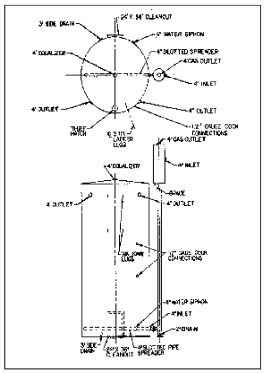 The layout of a gun barrel using a side boot. It’s possible and increasingly common to use a side boot to first separate more gas from the fluid. It first flows into the side boot, which is mounted outside and slightly higher than the tank. The fluid runs through a tube at the bottom of the boot to the bottom of the tank. From there, separation happens as normal, with the oil floating to the top and water remaining at the bottom. Because a gun barrel is operated entirely through gravity, to use a side boot the gun barrel needs to be mounted so that it sits about one foot above the fluid level in the stock tanks it feeds. 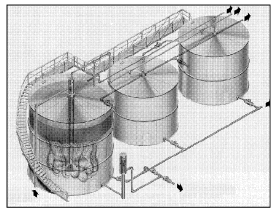 A stock tank is designed to hold produced and separated oil until it’s ready to be sold. Its layout is fairly similar to a gun barrel, and water will actually continue to fall out of the oil until it’s sent off either by pipe or truck, so some system for removing waste water is necessary with stock tanks, as well. You’ll usually need to accumulate enough oil to fill a 210 barrel transport tank. You don’t need the whole 210 barrels, more like 160 to 180. 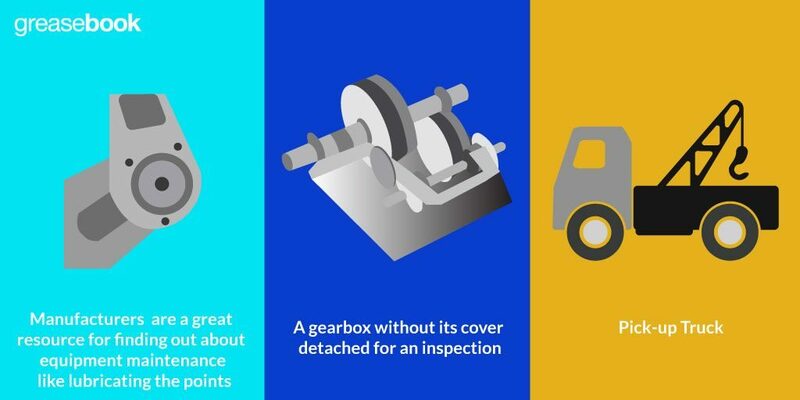 More than that, and a truck will weigh too much for most roads and highways. One way that a stock tank differs is that the level of fluid inside needs to be frequently measured. A common way of doing this is to use a simple plumb bob and line. 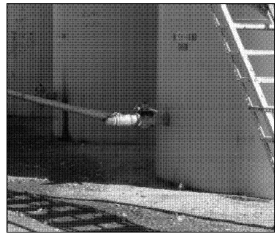 Dropping a metal plumb bob to the bottom of the tank multiple times a day can eventually lead to damage to the tank, however, so stock tanks will usually have an additional layer of metal, called a strike plate, placed under the thief hatch. There are several different stock tank designed. The simplest uses just a flat bottom. More specialized tanks have a conical bottom, which is very helpful in cleaning the stock tank. Paraffin and heavier oil can often collect water and become heavy enough to fall to the bottom (and in fact this mixture is commonly called bottoms), where it is difficult to remove. The conical shape collects most of these heavier elements at the very bottom, and encourages them to flow out through the drain. 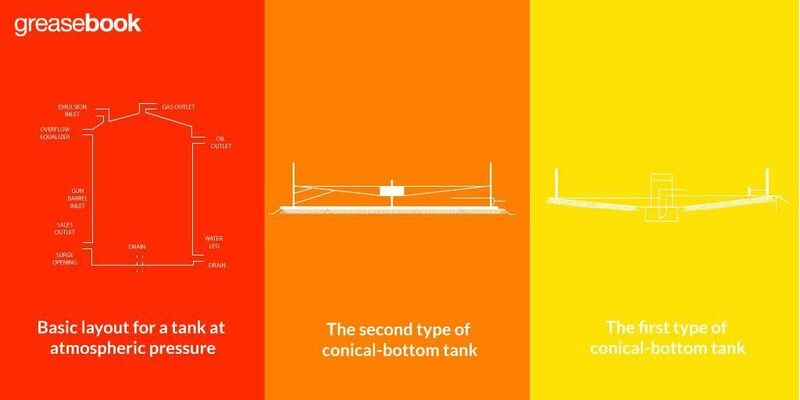 There’s two different types of conical bottomed stock tank. The first has a conical bottom that ends in a narrow sump, as pictured in Figure 7. Figure 7. The first type of conical-bottom tank. This type of tank needs a small pit, with sides at the correct angle to support the tank’s bottom, and a small area dug out for the sump. The hole should be lined with gravel and tar paper before the tank is placed. This helps prevent ground condensation which leads to corrosion. Figure 8. The second type of conical-bottom tank. The second type of tank rests on a metal plate, which keeps it from sinking into the ground. The conical bottom is open to the air, though it’s often protected and not visible. It’s easy to recognize these tanks as the openings have to be slightly higher, as the tank sits higher to allow room for the conical bottom. Figure 9. The second style that shows the higher outlet that’s necessary. Most stock tanks have four openings in the side of the tank. One, which should be placed in the front of the tank about a foot off the bottom, is the sales outlet. This is used to send the produced oil to a pipeline or truck when it’s sold (diagrams of these two sales methods can be seen here: Preparing and Selling Oil & Gas Production). The second is the drain, which is a 4 inch opening on the back of the tank and is about 4 inches from the bottom. At the top of the tank on either end will be openings to connect stock tanks together with equalizing lines, as explained above. The drain opening, placed about 4 inches from the bottom, will usually connect to a pipe that runs along the bottom, then turns down so that it ends about an inch from the bottom. Paraffin and heavier oil often collect on the bottom into a layer multiple inches thick. The drain will help keep the area immediately around the intake clear. Drilling a series of small holes into the bottom of the pipe can help to keep a wider area clean. The oil inlet for a stock tank will often have a downcomer so that the oil flows down directly to within a foot of the bottom. A couple of small holes should be drilled into the downcomer near the top to prevent creating a siphon effect and also allow gas to escape. The downcomer reduces static electricity in the oil, which can encourage hydrolysis and corrosion. It also reduces loss of lighter oil through evaporation. It also helps move the heavy layer that can collect on the bottom. As you might imagine, the water disposal tank is used for holding water before it’s disposed of. In emergencies, it can also be used as an overflow tank. It should have as a minimum capacity of about 200 barrels or one transport load. The tank is usually short to make water disposal a little bit easier. 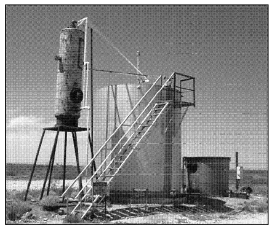 It’s generally pumped down a water disposal well, or a well used for water flood (a further write up on tanks for water disposal and water floods can be read here: Second Stage Recovery Methods For Oil & Gas Production). Figure 10. An example of a water disposal tank. Tanks can be manufactured in two halves, to make shipping to the location easier. 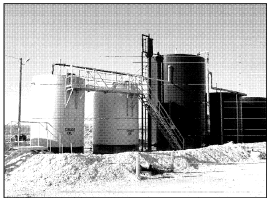 Due to regulations intended to protect the environment, the water tank has replaced the pit as a general disposal tank. The pit is basically an open tank with earthen walls built to hold water. The pit is usually has a plastic liner, which prevents the surrounding dirt from being contaminated with chemicals in the water. It may also have a net or mesh covering to keep animals out of the tank. In the past, the pit was called a slush pit. That tended to imply that it was filled with a slush of paraffin and a thicker fluid, which is no longer true. Pits can act as a holding tank or hold an emergency flair if necessary. Regulations may require a dike be built around all containers holding fluid that might contaminate the ground. Those regulations usually require that the dike be able to hold 1.5 times the amount of fluid all the vessels within it can contain. You’ll need to build a walkway over the dike in order to prevent it from being damaged by traffic. Figure 11. 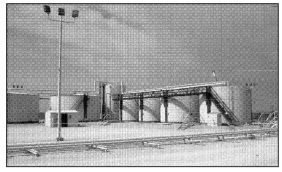 A dike around a tank battery, including a walkway over the dike. A gun barrel, stock tank, pit, and other vessels we’ve already talked about are all standard vessels in a tank battery. However, it’s not unusual to use tanks for much more tailored uses. You may need to install a number of these tanks in different areas for a variety of purposes. You may arrive at a lease, and see some unique or apparently odd arrangements. It’s important to understand why these tanks have been placed there, and what problems they are being used to solve. For example, a stock tank can easily be used as a gun barrel. A separator can be used for scrubbing liquid from gas for fueling a firebox. A line heater may be used to thin a thick emulsion, or between a separator and the header to prevent ice from forming. Some problems may require creative solutions.